Your best friend deserves to be warm and comfortably dry this Winter in a Silver Eagle Aussie Oilskin dog jacket, fully lined in soft thick luxurious Sherpa Fleece. Whippet and Greyhound styles are now available. No matter how active your pet can be, our products are built to last using our distinct and durable Australian Oilskin outer fabric. 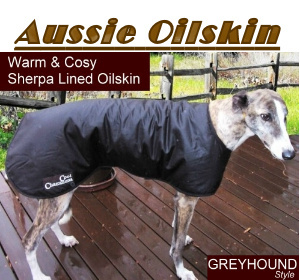 CoolChampions Greyhound Style Oilskin Jacket.